My recipe is a traditional Southern Cornbread with a little dose of healthy. 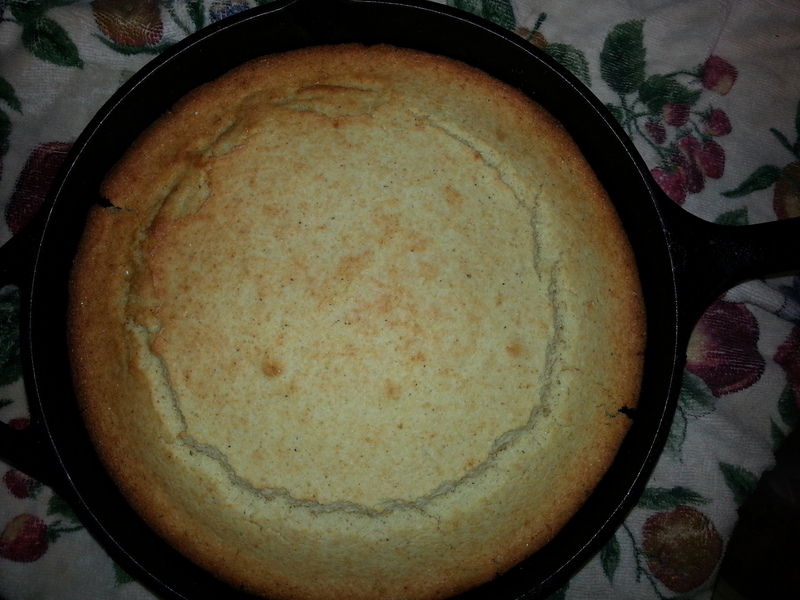 Here’s a photo of the hot cornbread I just pulled out of the oven. I cooked it in my old 9″ cast iron skillet but you can use muffin tins or whatever pan you have available. If you could just smell it – it smells so good that I couldn’t resist, I just had to cut myself a little slice and smear on some fresh butter – yummy! Start heating your oven to 450. Grease or spray your pan or muffin tins. I pour a little olive oil in my Iron Skillet. I put my skillet in the oven to ‘heat’ while I mix the cornbread. Mix these wet ingredients together. Stir just until the corn meal is incorporated into the wet ingredients. Pour this mixture into your hot pan – I like to hear a sizzle when I pour the cornbread into the pan. Bake about 20 minutes or until the bottom is brown and you start to see the top browning a little. Notes: I have used melted bacon grease and I have used Crisco and other solid shortenings in my cornbread and I can tell you that both of these options make a great cornbread! I just wanted to be a little bit more healthy so I used Olive Oil. Now spread on your butter and enjoy!